There are a lot of great shops, here are the shops run by my friends. Here are the shops where you’ll get the best gear for a great price, and there are nice people there, too! Where I teach. Best prices in town (ridiculously low) and nicest people. Old Town has been owned by the same person since 1994, and before that it was Denny’s Music, and Old Town is very kind to me. I have many years of experience working in guitar shops, repair shops and the like. Old Town does instrument sales, boutique and mass manufactured effects and pedals, synthesizers, guitars; instrument repair and custom electronic repair and buildouts. Dan runs a great little shop in SE Portland, I highly recommend him. This is an excerpt from a private lesson entitled Sampling 101 Class with Whirling Squirrel Music. To schedule a lesson at the Portland Oregon music studion or over Skype for distance education, click here. This is not a lesson for the experienced or intermediate electronic musician. It’s a beginning level lesson. In this lesson we are going to edit an audio file and cut it up for use as a sample. We will be using iTunes to convert audio file formats; we will be using Audacity to chop up the audio, and we will be using Reason for music production. Keep in mind that in the beginning, this stuff can be a little challenging, because there is a bunch of stuff you probably don’t know. It’s ok to take it slow. The best instruction comes from a teacher who is teaching you, in person or over Skype. Whirling Squirrel offers lessons on Ableton Live, Reason, Logic, Pro Tools, Cakewalk, or cassette tapes. Video lessons, so if you are not in Portland, contact me and we can set up video lessons. Step 1: Get the song on your computer. You need to have the song on your computer before you can edit it, and you need to see the folder the song is in. Import your Music From CD: THE IDEAL SITUATION FOR A BEGINNER LEARNING TO SAMPLE. iTunes: — Preferences… General…Import Settings…Import Using … WAV Encoder or MP3 Encoder. If you can’t find this, look under iTunes Advanced Menu for Import Settings. Put CD in computer. Open up iTunes and import the song into your iTunes library. Note: If the song is already on your computer, then find the audio file on your computer. Open up that folder. Step 2: Find out if your song is in a useable format. Go to the song folder. Windows users: Right Click—– Properties. Mac users: Control Click —– Get Info. If your song is: WAV, or AIFF (from CDs/PRO AUDIO) or MP3, then GOOD! If your songs is MP4 or M4A, or God forbid the copyright projected M4P, STOP!! and consider using a different song. If you are taking this lesson, converting files will not make the process fun. You are a BEGINNER. Do not try to do something awesome. Just try to do SOMETHING. If you really really want to convert stuff, go here first, before you move on to Step 3. http://wiki.audacityteam.org/index.php?title=How_to_import_files_from_iTunes … basically, it involves burning a CD out of an iTunes playlist, then, importing the CD back into your iTunes library as a WAV or MP3 format. Again, this stuff can be complex, so don’t hesitate to contact me for a lesson. Step 3: Convert files if necessary, to MP3 or WAV. Open up your song in iTunes. Right click (Windows) or Control Click (Mac). Convert to MP3. This also may be under Advanced – Create MP3 version. Then FIND IT in your iTunes library. Step 4: Get (import) the audio into Audacity. or you can IMPORT using the PROJECT menu. I recommend importing. Go to PROJECT … IMPORT AUDIO. Wav’s will take longer than MP3’s. Step 5: Chop it up into small samples. Use the Selection Tool. It looks like a big capital i. It’s in the upper left corner of the screen. Select audio you want to delete, and delete it. Mess around. Get the feeling of it. This is often where an in-person or video lesson comes in handy: here is the point in the lesson where I would show you how to use tool tips to figure out what tools do on your own. I would also show you how to chop up audio in a more advanced way. It really helps watching an expert when you are learning, so that you learn good work flow. For more information on my views check out my blog post here on kinesthetic learning processes. Select the audio you want. make sure you play it to hear it. Make it a SMALL, SHORT piece. File …. EXPORT Selection as WAV. Make sure you remember what folder you put it in! Better to make a folder called rad-samples on your desktop. Step 7: Rock your samples. Open up Reason, open up ReDrum Drum Machine, and assign the sample to one of the triggers. Open up Ableton and use the File Browser to HOT SWAP a sample in Impulse drum machine or similar instrumentation. There are other options as well for Logic, Pro Tools, Cakewalk, etc. Trigger the sample whenever, and record it in a session. Export your session as a wav file. In this article, I’m going to address some of the typical problems that “cheap” guitars have. When a guitar has a “setup” already done, it means that the action and “settings” on the guitar are optimized to help you play the instrument. Not all shops do this, especially for their “super cheap” guitars (more below). Make sure the guitar you’re looking at has been “setup.” Ask your salesperson: “hey, has this guitar had a setup yet?” If not, do not buy it. The word “cheap guitar” is relative. If you’re saying, “I’ve decided the amount I want to spend for a guitar, yet I don’t know anything about guitars or the industry,” you may be choosing the wrong thing. It is very difficult to make concrete decisions about things you’re really unfamiliar with. Sometimes it can be better to do research and learn how the market is, and then adjust to that. Hopefully this article will help you do that. I have custom books made by wealthy people – former customers of the custom shop I used to work at – of their entire guitar collections, which are worth millions of dollars. I’ve sold $70,000 vintage collector’s guitars. This post isn’t a “gear snob” post for people like me. This is for beginners who are just looking to buy an inexpensive guitar. Less than $100 (do not buy new): It is fairly likely that you will be be buying an instrument that is permanently damaged beyond reasonable repair. Between $100 and $250 (do not buy new): There is a chance that the instrument that you are buying may not be permanently damaged beyond repair. With careful inspection using the tips below, proceed with caution. $500 to $1000 (do not buy new): You’re going to have a good time. Make sure you use the tips below, however. $1000 (do not buy new): Now you’re like me. $2000: Only people with “real money” buy guitars this expensive. That excludes pretty much all musicians. I’ve never paid this much for a guitar, and I never will. I consider it unnecessary. 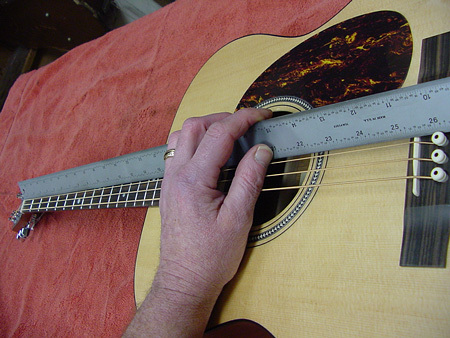 Regardless of the price point of your guitar, you’ll need to check it for a few things. 1 – Avoid High Action – but not so low that it buzzes. 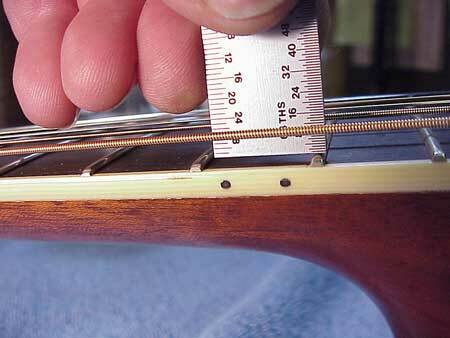 This is the most important issue for all guitars, but especially cheap ones. This is how luthiers check the action on a guitar. High Action can be assessed relatively easily, visually. Play the guitar – if you like an electric guitar but it seems a bit hard to play, ask the store to adjust the action. If it’s an acoustic guitar, you’ll have to pay to have the action lowered. Don’t be overly picky in the store about action before purchasing; skill still matters. If the luthier tells you “it can’t get any lower without buzzing,” then believe them, and take a few lessons so you learn about how to avoid buzz. A deal from Guitar Center is not a deal, it is a waste of time and money. If you’re buying a NEW guitar, you just spent $300 on something that would have cost $100 otherwise. If you don’t play in bands, being in a music store may seem intimidating; but you won’t learn how to interact in a music store by going to Guitar Center. Go to the local shop first. Even if you don’t buy anything. You’ll save thousands in the long run. Unmarked recording studios and shops are a hallmark of music industry tradition. Nondescript, small shops are generally the higher quality, better reputation places for guitar purchase and repair. The best shops are the quieter, local shops. The quiet, local, cool shops attract quiet, cool people who know their stuff. They are there to build a good reputation. 5 – Salespeople on commission are more aggressive. Great shops are where you get left alone. Don’t interpret a salesperson bothering you as “customer service.” They want to spend your money. I offer this service for free to my students; owners of music shops love when I bring in customers who buy things. It’s symbiotic, there would be no reason for me to charge students in helping them buy guitars. Contact me to make an appointment. Good teachers generally accompany their students to guitar shops, because a teacher would rather spend an hour helping a student, instead of helping that student deal with a low quality instrument for years. 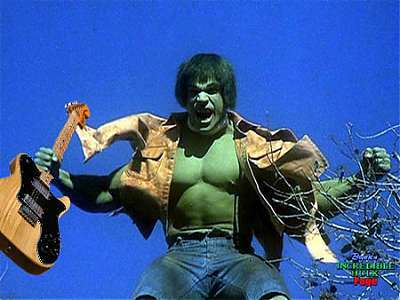 only hulk can haz a tele. This is a picture of an oak Telecaster. By the way – if you’re starting out, don’t buy a Telecaster. Again, if you like it buy it, but try to avoid the Les Pauls and heavier guitars at first. Telecasters are cranky, tough guitars. 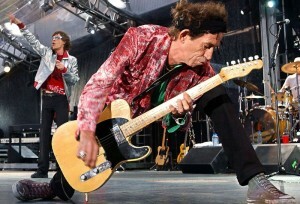 Muddy Waters, Jimmy Page, James Burton, Jack White, and Curtis Mayfield play(ed) Telecasters, and Keith Richards both plays Telecasters and uses them to hit people with who come onstage with the Stones (no, really). I had a Tele for 15 years, and I bought it because I wanted to play the most difficult guitar on earth to level up my skills and tone. Almost anything else that you pick, will be easier to play than a Telecaster. Please do not buy one if you are a beginner. Tomorrow and Sunday, I’m a judge for the Oregon Lego Robotics tournaments. I’m lucky enough to be able to do a lot of interesting things, but I’m posting this to the Whirling Squirrel site because it involves kids. I’m so excited to be a part of this and to help Oregon youth immerse themselves in science and technology. FIRST LEGO League (FLL) is an entry-level robotics program for 9 – 14 year olds using a LEGO Mindstorm NXT robot kit to meet an annual robotic and research challenge based on real world issues. Last year was at the Evergreen Air Museum in McMinnville, so we were surrounded by jets, planes, bombers, and as shown below, Howard Hughes’ Spruce Goose. Built in 1947, the Spruce Goose (made out of wood due to restrictions on materials due to the war) remains the largest flying boat ever made, to this day. A flying boat is a plane that can land on water. I’ve been recording a political heavy metal album that’s still kinda secret, with a few friends. This project will involve a LOT of editing on my part, as we are editing our music around clips (which clips exactly, will remain a secret for right now). It’s a bit odd for me, because I’m somewhat of an old school perfectionist: I’d rather do a bunch of takes, and use the perfect take. It’s fun and I look forward to more editing in Pro Tools. Punching in, cross fades for smooth wave forms and edits, are part of my daily life right now. LOL!! I’ve played the metal tracks for a few friends of mine, and of course for my bandmates. A lot of people are very excited about the record. The first song has a lot of twin guitar harmonies, very Iron Maiden-esque. I’ve been teaching the guitar in Portland for 11 years. Over time I became bored with the guitar, and focused on playing synthesizers, and using programs like Ableton Live and Reason for music performance and production. After many requests from my students, I began to teach Ableton Live, beatmaking, and hip hop music production and performance. Being “classically trained” in rhythm gives you creative control over your own beats. Usually these classes begin with rhythm theory, then cover drum set theory, then we program beats on hardware drum machines before working with Ableton and Reason, and similar software.